NASA's Mars Helicopter has proven its off-world mettle. Mars Helicopter team members work the flight model (the vehicle going to Mars) in the Space Simulator, a 25-foot-wide (7.62 meters) vacuum chamber, at NASA's Jet Propulsion Laboratory in Pasadena, California. The 4-lb. (1.8 kilograms) aircraft, a technology demonstration that will launch with NASA's next Mars rover in July 2020, aced its first-ever test flight under Red Planet conditions, agency officials announced Thursday (March 28). "Gearing up for that first flight on Mars, we have logged over 75 minutes of flying time with an engineering model, which was a close approximation of our helicopter," Mars Helicopter project manager MiMi Aung, of NASA's Jet Propulsion Laboratory (JPL) in Pasadena, California, said in a statement. "But this recent test of the flight model was the real deal," she added. "This is our helicopter bound for Mars. We needed to see that it worked as advertised." The test took place in January in the Space Simulator, a 25-foot-wide (7.62 meters) vacuum chamber at JPL that has helped prep many robotic planetary explorers over the decades. Aung and her colleagues configured the chamber to mimic the wispy, carbon-dioxide-dominated Martian atmosphere, which is just 1 percent as thick as that of Earth. The results were encouraging, to say the least. "The gravity offload system performed perfectly, just like our helicopter," Mars Helicopter test conductor Teddy Tzanetos, also of JPL, said in the same statement. "We only required a 2-inch [5 centimeters] hover to obtain all the data sets needed to confirm that our Mars helicopter flies autonomously as designed in a thin, Mars-like atmosphere; there was no need to go higher. It was a heck of a first flight." 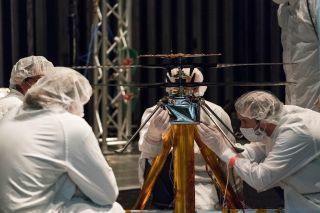 This image of the flight model of NASA's Mars Helicopter was taken on Feb. 14, 2019, in a clean room at NASA's Jet Propulsion Laboratory in Pasadena, California. The helicopter performed similarly well in a second test the next day, project team members said. So, the little drone is ready for the Red Planet — and its place in history as the first craft ever to ply the skies of an alien world. "The next time we fly, we fly on Mars," Aung said. "Watching our helicopter go through its paces in the chamber, I couldn't help but think about the historic vehicles that have been in there in the past. The chamber hosted missions from the Ranger moon probes to the Voyagers to Cassini, and every Mars rover ever flown. To see our helicopter in there reminded me we are on our way to making a little chunk of space history as well." More than 1,500 individual pieces of carbon fiber, flight-grade aluminum, silicon, copper, foil and foam went into NASA’s Mars Helicopter, which will launch with the agency’s next Red Planet rover in July 2020. At some point after Mars 2020's February 2021 touchdown inside Jezero Crater, the little chopper — which sports two 5.9-foot-long (1.8 m) rotors — will drop from the rover's belly onto Mars' red dirt. The helicopter will then make a handful of test flights, each lasting a maximum of 90 seconds. The main goal is to show that little drones can indeed explore Mars from the air. Success could pave the way for ambitious future missions that involve fleets of helicopters doing scouting activities for rovers or conducting science work on their own, NASA officials have said.